No veggie burgers this week! Finally picked up some other stuff. 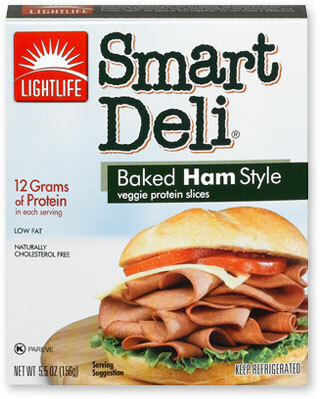 This week, we're back to Lightlife's Smart Deli line with Smart Deli Ham. I'd had a pretty good experience with their pepperoni, so I was cautiously optimistic. However, as soon as I opened the box, my concerns were alive and well. 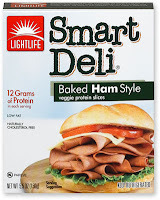 Dear Lightlife, ham is not brownish-orange. Ham is pink. See what you can do about that. I grudgingly opened the plastic surrounding this brown meat, thinking that if I ever encountered real-meat ham that looked like that, I'd throw it right in the trash. Outside. Actually, the neighbor's trash can, maybe. That might be far enough. But I boldly put some of it into my mouth. Lo and behold, it actually tasted pretty good. And not only that, but remarkably similar to ham. I was a little worried about the almost-first ingredient being wheat gluten, because usually highly gluten-y products have a super gross taste, but this one was pretty much just ham-flavored. So, all you practically-life-long vegetarians who haven't ever eaten ham or just forgot, this is pretty close to what ham tastes like. Now you know. I even tried it with a cracker and some swiss cheese (my favorite thing to do with lunchmeat ham), and it tasted just like real ham with swiss cheese. I'm very impressed. Flavor - very hammy - I like it! I feel like I've been reviewing a lot of veggie burgers lately. I really need to get to the co-op and pick up some non-veggie-burger fake meat soon. Any requests? I can't promise my co-op will carry it, but I'll look. For now, you get to read about Morningstar Farms Garden Veggie Patties. This seemed like it would be the standard veggie burger experience. I did my usual oil-in-the-skillet routine, flipping it a couple times until it was hot and crispy, tossed it on a bun with some ketchup and a slice of tomato and gave it a bite. Unfortunately, this was not the standard veggie burger experience. I'm not sure exactly what I was tasting, but there was an unpleasant off-flavor. Then I bit into a water chestnut. Those things are so gross. Why would anyone use them? The texture makes my teeth shiver, and they contribute no flavor. What a stupid ingredient. Ultimately, I decided not to eat the rest of my burger and gave it to my wife. She found it tasted much better with mustard, if you're into that sort of thing. 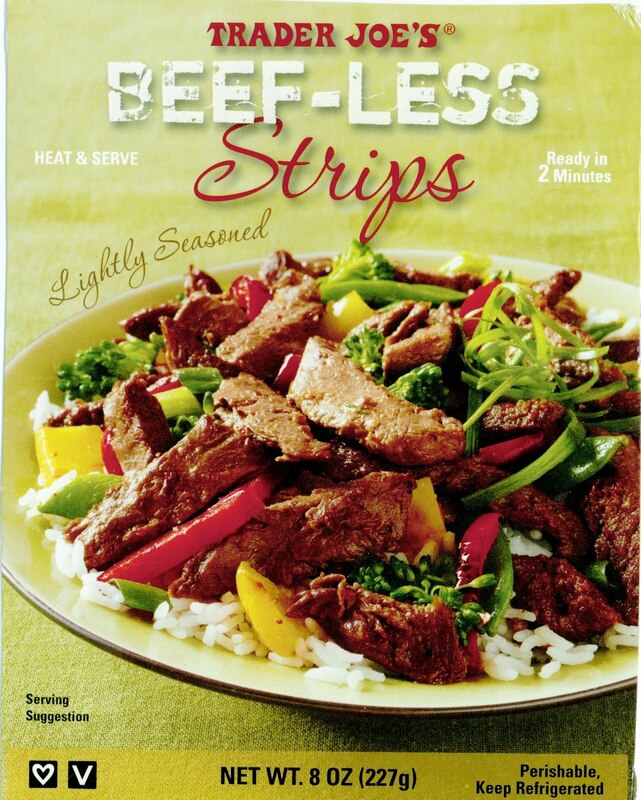 Ever since the major disappointment with Trader Joe's Chicken-less strips, I've been hiding their beef-less strips in the freezer, afraid to try them out. Today, I finally dug them out and decided to give them a shot. I wanted to give them the best chances of succeeding that I could, so I went with a flavoring that I expected to drown out any flavors inherent in the product - taco seasoning. I decided to whip up a nice taco salad for lunch. I chopped up some lettuce while the strips thawed out, dumped some taco seasoning on the strips, and added the requisite amount of water. Then, since I think the strips absorbed some of the water, I had to add some more, as the seasoning hadn't fully dissolved and was looking a little chunky. Finally, they were ready to eat. I topped the lettuce with a generous portion of the strips, since I wasn't going to be sharing them. Then, before adding the rest of the ingredients I was planning to add, I decided to taste one of the strips. I'm very glad I did, because I wasn't going to be able to eat that salad. These things were even worse than the chicken-less strips. The texture actually wasn't too bad - it was kind of chewy - not exactly beef-like, but not unpleasant. However, they actually managed to overpower the flavor of the taco seasoning. All that remained was the spiciness of the seasoning - any taco-like flavors were gone. Where did they go? Who knows? 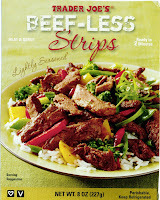 All I could taste was that disgusting beef-less beef strip flavor. I thought about trying to add more seasoning, but at this point, I didn't want to waste it. Time for a new lunch plan.